Aiii Shot The DJ was a different beast on the album as a standard dance track featuring the return of the high-pitched vocals that had been undergoing a lengthy six-year sabbatical. Scooter opted not to release this version, even though it is a perfectly fine tune in its own rite. Instead, they tweaked it to sound more like a party anthem. The Radio Version slaps you with an explosion, followed by a phaser-infused synth and H.P. 's wacky lyrics about "comin' at ya like Cleopatra" and asking where the "punani" is. A class act all the way. Then the high-pitched voice hits you like a crazy brick; I have never known what it's saying exactly, and I never will, but it's catchy, I'll give you that. And in the middle of all this frenzy, H.P. stops the track for a bit to give us some funky beats while a computeresque voice says, "Westside..." Looking for a little street cred, Scooter? Well, you're not going to get it with chipmunk voices! As a party track, this one does the job, and although it isn't Scooter's most memorable moment, it's a solid entry in their discography. The Extended Version is just that: a longer version of the radio edit. And the Bite The Bullet Mix is essentially an H.P.-free club mix of the track, so if you love instrumentals with just a titch of high-pitched vocals for that extra cheesy flavour, this is the one for you. Is Aiii Shot The DJ the great party pleaser it was meant to be? I'm certain you could crank it up at any overly zany shindig and cause a few roofs to be raised. 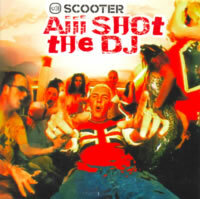 Although I am also fond of the album version, Aiii Shot The DJ shows off Scooter's love of raving and partymaking with a fairly unique dance tune. It's a shame that you basically get the same song three times over on the single, with the added lack of a B-Side. Plus, how can you dislike a music video featuring the trio having to shuffle around a dead person's body through his daily routines? It's impossible!